The Japanese Spider Crab, Macrocheira kaempferi, is a giant marine crab inhabits in the sea around Japan, is the largest in arthropods, taxonomically an old species called “Living fossil”, is classified in order Decapoda, infraorder Brachyura, family Majidae. A German naturalist Engelbert Kaempfer arrived in Dejima Island in Nagasaki Japan in 1690, wrote two books “Amoenitatum Exoticarum” and “History of Japan”, are about the country’s natural history, that introduced a giant crab which he encountered at the beach in Suruga Bay. Afterward, Philipp Franz von Siebold –the father of the first Japanese female physician Oine- is whom edited a series of monograph on the zoology of Japan titled “Fauna Japonica” (published serially in five volumes between 1833 to 1850), with a Dutch zoologist Wilhem de Haan whom specialized in insects and crustaceans; the specific epithet “kaempferi” was named by de Haan, that commemorates Engelbert Kaempfer; “Macrocheira” in the binominal name means giant claw. It is said that they are indigenous to the sea around Japan, yet are distributed from off Iwate to Kyushu district along the Pacific side coast, that contain the East China Sea, Suruga Bay, Tosa Bay; moreover, they were found in the east of Taiwan in 1989. Some said the female crabs’ taste is better than the males’, yet the flesh (the eatable parts) is few in spite of their giant bodies. The taste itself is said delicious or tasteless, is diverse, but they are the largest crustacean would be worth eating. The crabs in a size of nearly 3m are called “Jumbo”, are not eatable due to the texture of their hard flesh like rubber. Traditionally, in Numazu city in Shizuoka prefecture, grotesque facial pictures have been drown on the back of the crabs as a talisman for rice harvest, to be protected from birds, instead of setting scarecrows; the talismans were called “Shibito-Gani (Human corpse crab)” or “Heike-Gani (Taira clan crab – from the name of a major Japanese clan of samurai)”; in Omaezaki in the same prefecture, they are called “Men-Gani (Facial crab)”, used also as a talisman, moreover, there is a picture depicting an extraordinary giant crab attacking a child at the coast. 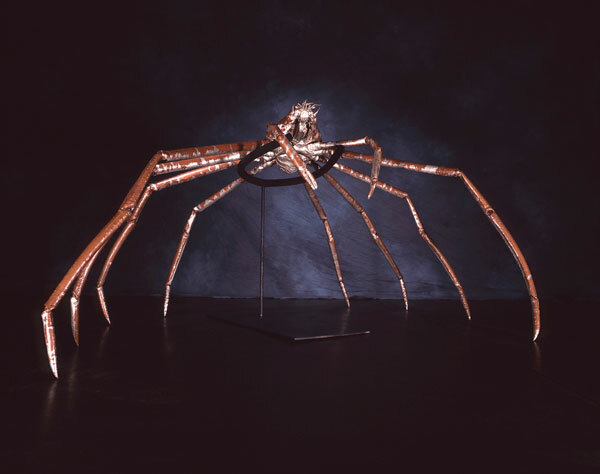 Thus may indicate Japanese Spider Crab was supposed to be a grotesque creature of long legs with oval body since centuries ago. In addition, Japanese Spider Crab can move to any directions because of its long legs. This work was made for my completion of the MA course at the college, with a concept that simply reflects my wish to make the largest crustacean in the world. To follow the concept, to make the male crab with the bigger claw seemed more appropriate, but the consideration for the balance between the legs and chelipeds (claws), and the beautiful figure include its abdomen, changed the decision into making the female crab. The legs and chelipeds of which are of course movable, and even abdomen, mouse, tentacles as well, was wholly made up of copper by hammering; the white spots were depicted by silver soldering; the orange of its whole body was colored by the technique called Nieiro (a kind of metal oxidation). Every archetypal models of my works are usually kept at the studio, however, this case required me to go to Toda port in Izu, and the negotiation with the chief dealer for the crab that was not usually sold for take away (to the other cities), yet was exceptionally permitted with his kindness, and by my enthusiasm. I very much appreciate it.